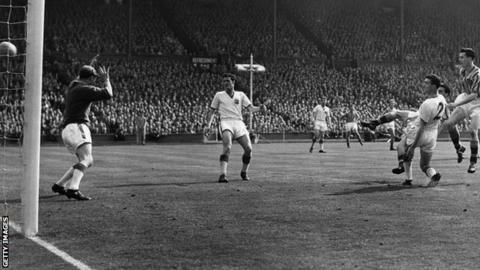 Peter McParland scores Aston Villa's second goal against Manchester United at Wembley in the 1957 FA Cup final. Aston Villa and Falkirk could both end a 58-year wait to win their domestic cups when they walk out at Wembley and Hampden respectively on 30 May. Both were winners in 1957, but neither side have won their national cup since. Falkirk have only won the Scottish Cup one other time - in 1913, when Villa were again FA Cup winners. Villa will meet Arsenal, while Falkirk face Inverness Caledonian Thistle, after both sides won their semi-finals at the weekend. "That's strange, that's really strange," Falkirk manager Peter Houston told BBC Scotland. "Certainly we go in as underdogs and probably Aston Villa got to the final as underdogs as well. "So, here's hoping that both Falkirk and Aston Villa can win the cup in 2015." Tim Sherwood, currently battling to keep Villa in the Premier League, led his side to the final after goals from Christian Benteke and Fabian Delph defeated Liverpool. It will be their first final since 2000, when Roberto Di Matteo scored to claim victory for Chelsea in the last one played at the old Wembley. Back in 1957, they lifted the trophy after getting the better of Manchester United, with 99,225 packed under the Twin Towers. Peter McParland was the hero with a double, notching seven altogether in that year's competition, as the claret and blues lifted the Cup for a then-best seventh time. Sunday's semi-final win over Liverpool was on the 102nd anniversary of the 1913 Cup win, won through Tommy Barber's goal 12 minutes from time against Sunderland in front of 121,919 fans. On Saturday, Craig Sibbald's only goal of the game for Falkirk saw off fellow Scottish Championship side Hibernian. It will be the Bairns' fifth final and the first since a 1-0 loss to Rangers in 2009, when Nacho Novo scored seconds after half-time for Walter Smith's men. That was their second attempt to win the trophy for a third time after they also lost 1-0 to Kilmarnock in 1997, the Ayrshire side gaining revenge for that defeat on 24 April 1957. Four days earlier, the two sides drew 1-1 in front of 81,375 at Hampden, with John Prentice's penalty cancelled out by David Curlett. In the replay in front of another huge attendance of 79,760 in Glasgow's south side, Curlett again cancelled out a Falkirk opener, this time by George Merchant. However, Doug Moran pounced on a poor clearance in extra-time to ensure the Cup went back to Brockville for the second time. The first of those triumphs came on 12 April 1913, with a 2-0 win over Raith Rovers in a final played at Celtic Park. The Scottish FA had moved finals away from Hampden until 1922 after there was a riot following the 1909 Cup final replay between Rangers and Celtic.